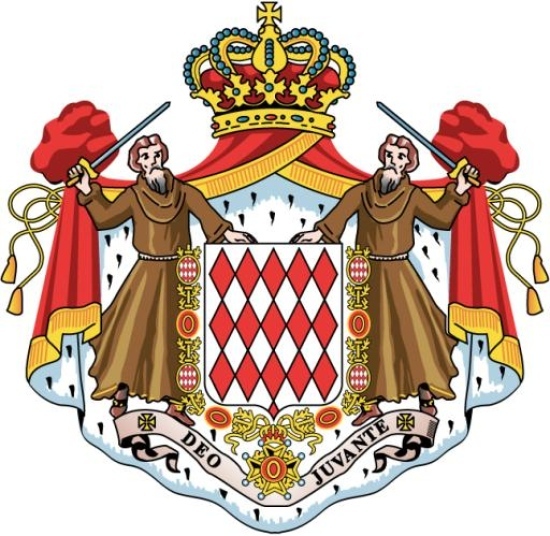 Richness in pageantry and heraldry is one of the fortunate endowments of Monaco — all incorporated in the Monegasque symbols that form part of our celebrations throughout the year. 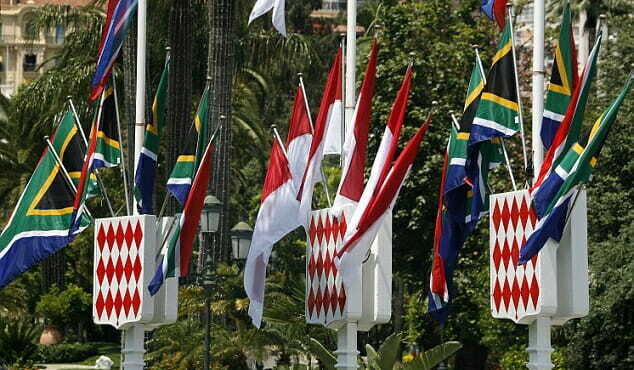 These symbols, whether it be the Princely Flag, the Monegasque Hymn, celebrations around the patron Saint Devote, even the Monegasque language itself are woven into our cultural experience of this beautiful country. Did you know that there is more than one flag? More on that later. Let’s start with the State Flag which is rich in symbolism. Prominent are two bearded monks, wearing shoes and brandishing swords. Go back to 1297 when François(Francesco) Grimaldi surprised the Genoese, who had garrisoned the Rock. François approached with his soldiers in monk’s disguise and with swords hidden under their monks’ robes. They put the Genoese to flight to reclaim Monaco in the name of the Grimaldis. There is an interesting and little-known curiosity, illustrated in past flags, with the monks shown as clean shaven. It is now firmly established that the symbolic monks on the Princely Flag are bearded. 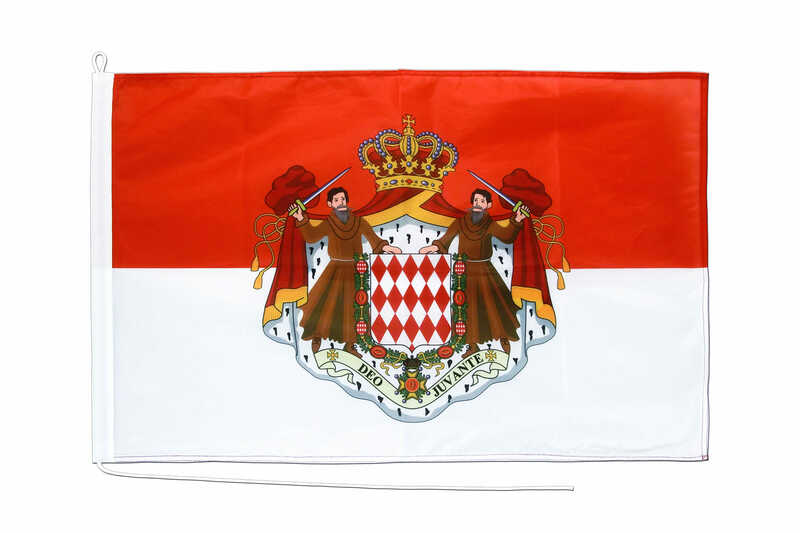 And before passing to the coat of arms on the flag, did you know that the word «Monaco» itself is Italian for monk? One way or another, François Grimaldi’s daring exploit could even be regarded to be enshrined symbolically in the Principality’s own name. There is a lovely heraldic phrase for the decorative coat of arms on the shield with the attractive red diamond pattern on white. The phrase is «lozengey argent and gules» which are the colours of the Grimaldi family. Surrounding the shield is a collar showing the highest class of Order of Saint-Charles which was founded by Prince Charles III in 1858. All is surrounded by a royal cloak lined with ermine on which sits a Princely crown. At important points in Monaco’s history, and first in the 17th century, Monaco’s rulers were titled Princes, rather than Lords at its origin. Finally, there is the motto on the flag which is displayed on a scrolled ribbon below the Friars’ feet «Deo Juvante» («With God’s help»). The flag in its current form was adopted by Charles III. Another interesting minor curiosity is that there is another informal version of the coat of arms occasionally illustrated on car plates where instead of monks there are buglers. Returning to the subject of multiple flags, there is also the prominent National Flag of Monaco sporting the House of Grimaldi colours of broad equal red (on top) and white bands. This present bi-colour design again dates back to Charles III on April 4, 1881. Though sometimes mistakenly thought of linked to Sainte Devote the colours originate from the historic Grimaldi family and their place in the Genoese ruling elite, certainly dating back to at least 1339. When the Grimaldis established their independence from Genoa they brought their colours with them. There is a third discreet flag personalized for each Prince with the Crown of Monaco over a motif showing a duo of the Prince’s initials, all on a white background and with a gold fringe. 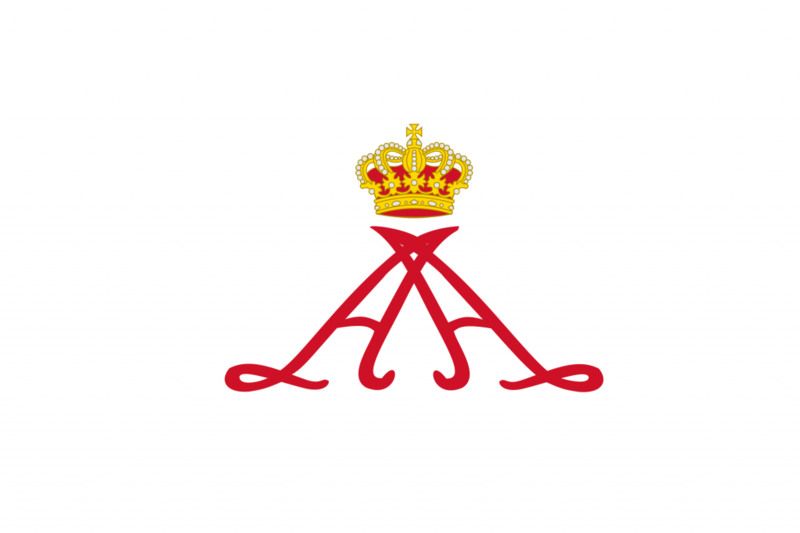 Prince Albert’s father, Prince Rainier’s, for example, showed the duo initials RR and Prince Albert’s has the duo initials AA. 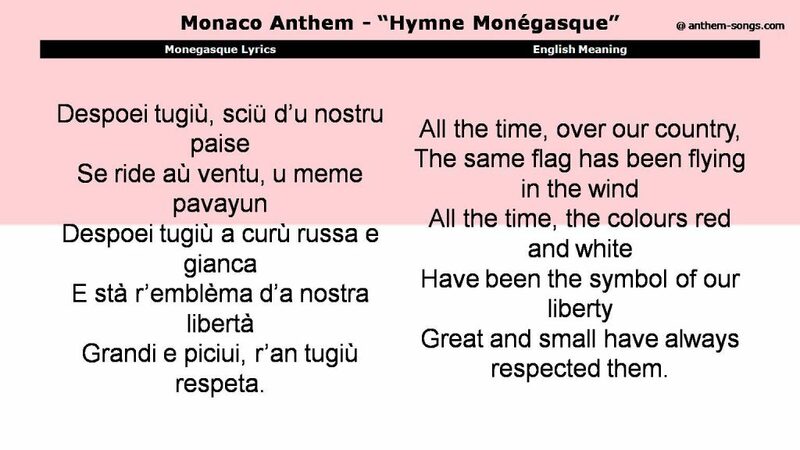 Did you know the Monaco’s National Anthem has played an important part in maintaining Monaco’s status as an independent country? The origin of the National Anthem was at an important turning point in Monaco’s history with all the turbulence surrounding the end of the reign of Napoleon. Monaco with the Princely Grimaldi family at the helm had to defend itself against numerous Machiavellian diplomatic developments as the Napoleonic order was swept away. The most immediate threat was the de facto secession of the formerly attached cities of Menton and Roquebrune. What if these cities, not satisfied just with seceding, tried to overthrow the ruling order in Monaco..? And so the National Anthem was created as a loyal rallying cry in 1841 around the Prince Florestan’s Guarde Nationale. Its author Theophile Bellando de Castro was a Captain in the Guarde and a notary. In its original version the patriotic lyrics were sung in French. Slight modifications to the melody were made by Castil-Blaze, a friend of Prince Florestan. 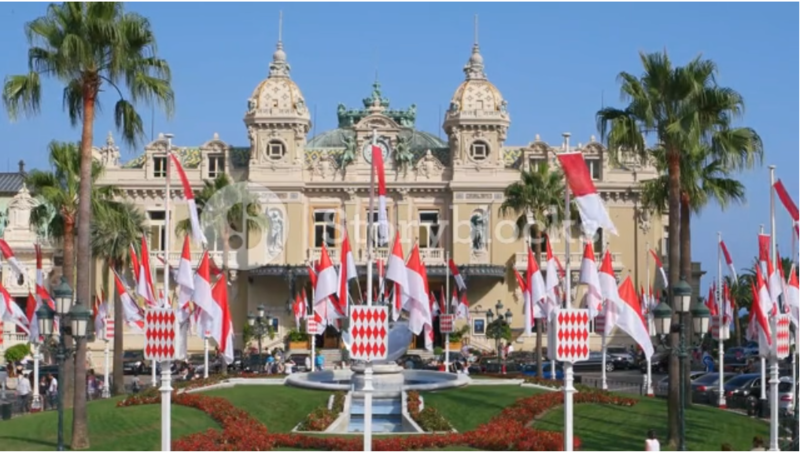 Later the National Anthem became a proud facet of Monaco’s rising prosperity with its Casino and Bains de Mer. 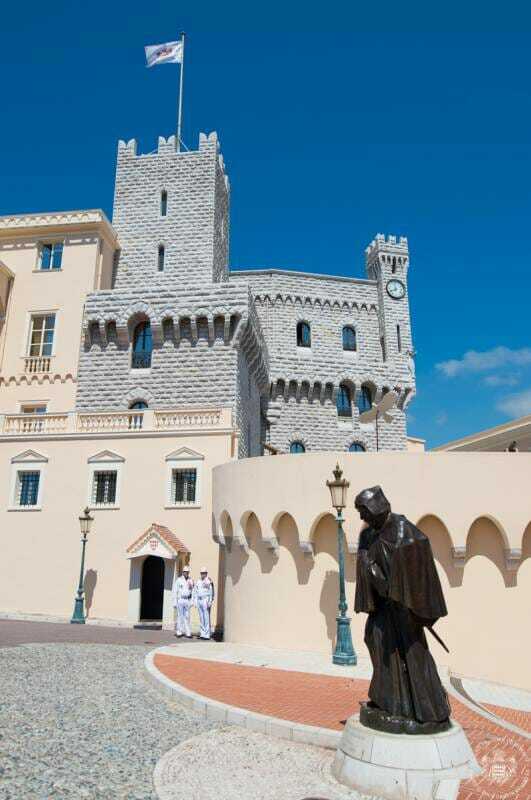 Monaco’s international renown was cultivated by Prince Charles III. There were more and more international dignitaries and Heads of State to entertain — always to be regaled by Monaco’s National Anthem. And so Prince Charles requisitioned an embellishment of the Anthem. This was undertaken by composer Charles Albrecht. Eventually another embellishment by François Bellini went a little too far and the Anthem became a little unwieldy, a bit too long for audiences. Its current crisp and lively version with trumpets is owed to Prince Albert I who had a modern version created in 1914 by Leon Jenin, director of the Opera and Classical Music of Monte-Carlo Orchestra. There is one single Monaco National Anthem, patriotic and uplifting, around which everyone congregates. 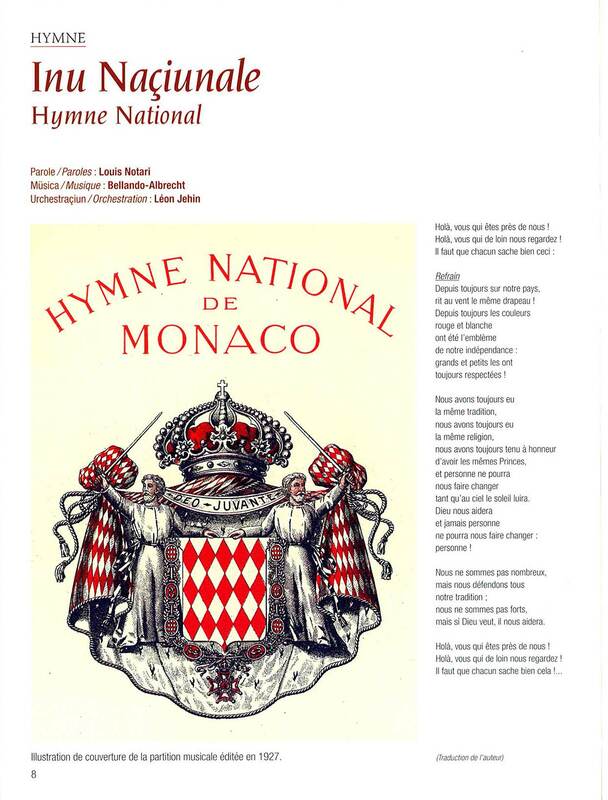 And in the final step in the evolution of the Monaco Anthem (or «Hymne Monégasque») the Prince in 1931 also supported the creation of elegant and simple lyrics in Monegasque, by the famous poet Louis Notari. 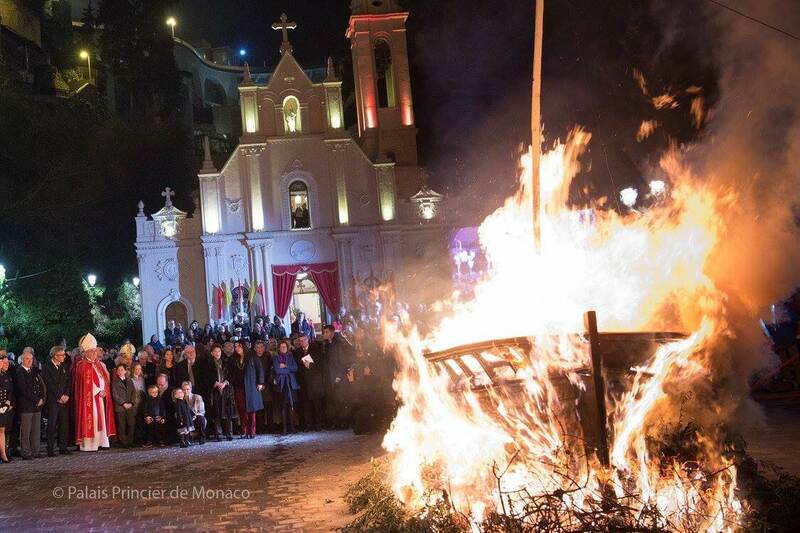 Finally let’s not forget the powerful symbolic events surrounding the celebrations of Monaco’s Saint Devote. 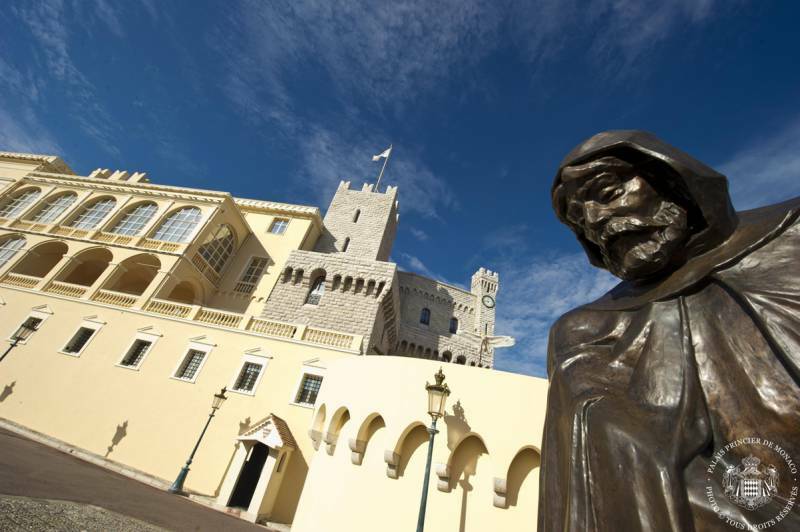 On the morning of January 26th, a religious service called «La Messe des Traditions» said in Monegasque takes place in Saint Devote chapel. In the early evening, numerous faithful gather on the Albert I embankment to attend the arrival of the symbolic boat and the reception of the Saint Devote relics which are followed by the procession that leads as far as Saint Devote church. 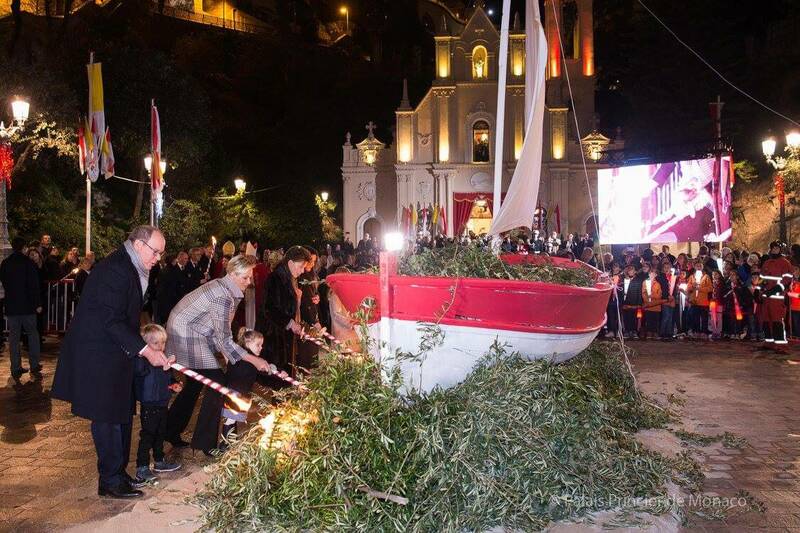 After the Worship of the Holy Sacrament, the symbolic boat is set alight by the Sovereign Prince and his Royal Family in the memory of Saint Devote.